Ingenico Group (Euronext: FR0000125346 – ING), the global leader in seamless payment, today announced the launch of OP2GO its comprehensive open payment solution for ticketing platforms. Comprised of secure contactless readers supporting both closed- and open-loop cards, inspection devices, a payment gateway as well as acquiring services, OP2GO integrates with all ticketing platforms. Smart cities implement information and communication technologies (ICT) to improve sustainability, create efficiencies, and enhance economic development and the quality of life in local communities. With open payment, transport providers and especially mass transit operators contribute to the development of this new type of urban areas. Open payment technology is changing the way we travel by swapping paper-based tickets for NFC-enabled devices such as bank cards and mobile phones. No pre-registration is required – travellers just tap the validator to enter and exit, then the system automatically calculates the best-value ticket for them at the end of their journey, whether it be a single trip, day pass or multi-day card. Open payment reduces queues at ticket vending machines (TVM) and improves occasional travellers’ and commuters’ experiences. It benefits transport operators as well by increasing ridership and creating operational efficiencies. 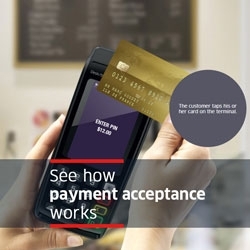 Processing open payment transactions is up to four times cheaper than issuing paper tickets and occasional closed-loop cards. It also reduces cash handling. Building on its leadership in payment acceptance for TVM and prior deployments of open payment systems in Europe, Ingenico decided to complement its transport offer with a dedicated open payment solution, OP2GO, which comes in two versions. The OP2GO Acceptance, on the one hand, includes Open/1500 and Open/2500 NFC devices for validators, gates and turnstiles; payment and ticketing applications, The Estate Manager for terminal management, and hardware services. The OP2GO Gateway - available in Europe and Australia – features, beyond all components of the Acceptance bundle, a payment gateway dedicated to transport and acquiring services, and E-receipt, a secure web access to the traveller portal. Ingenico’s Open/1500 and Open/2500 belong to a new generation of unattended devices blending the best of the transport and payment worlds. Easily integrating into bus and tram validators, station gates and turnstiles, these readers support all NFC devices: closed- or open-loop cards and smartphones. The Open series meets both transport industry requirements in terms of speed and durability, and the highest payment security standards (PCI-PTS v5.1).